← India to cut down on defence spending. Warplanes thundered and helicopters performed in concert in the skies as they brought up the curtain on Aero India 2013 at the Yelahanka Airbase on Wednesday. Considered Asia’s biggest air extravaganza, the air show that was held in the national aerospace heartland was a display of the country’s military strike power. A coordinated flypast of three MI-8 helicopters, carrying the flags of the Army, Navy and the Air Force, signalled the start of the event on a sunny morning. The five-day air show and exposition, attended by over 25 countries and 650 national and overseas companies, was proof of the country’s growing presence in civil and military aviation, Defence Minister A.K. Antony said as he opened the ninth edition of the event. The Ministry of Defence organises the air show every second year. “Domestic participation has gone up considerably in Aero India 2013 and we are happy about it. Self- reliance in defence is our focus area. We want to create a strong defence industry base,” Mr. Antony said. Heads of global aerospace companies, military chiefs, air force personnel, scientists and officials are attending the event. This year, his Ministry had difficulty in accommodating the increasing demand from participants, though the exhibition space had grown 60 per cent over 2011, the Minister said later. On the flying and tarmac side, though, there were fewer planes than in 2011. 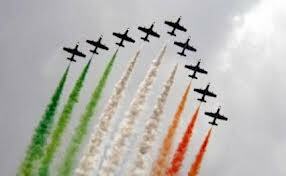 The crowds will miss their old favourites and the big fighters, including the colourful Surya Kiran display planes. A Defence Ministry official said that with the MMRCA mega deal as good as clinched by the French entry Rafale, the other contenders – Russia’s MiG-35, the U.S. Boeing A/F-18 and the Swedish Saab JAS 39 Gripen – stayed away. As the flying displays began, the tiny World War II vintage trainer aircraft, the yellow de Havilland ‘Tiger Moth’, did the opening honour. The uniquely private sector-owned Czech aerobatics team of four blue Flying Bulls danced in sync. The IAF’s war machine Sukhoi-30 MkI, the home-grown light combat aircraft, Tejas, flown by Gp Cap. Suneet Krishna, showed off some heart stopping vertical climbs. The Sarang helicopter aerobatics team was there as well as the border sentinels – the unmanned surveillance plane and the Embraer-mounted Indian Airborne Early Warning & Control System radar. The Rafale, however, stole the thunder. Its maker, French major Dassault Aviation, has brought in two of them for flying and one for display. The Rafale will join the IAF’s attack fleet, if the Ministry’s ongoing price negotiations for the estimated Rs. 50,000-crore deal clicks. The British-made Hawk jet trainer, Boeing’s C-17 military transport plane, both acquired by the IAF, HAL’s weaponised light helicopter Rudra and the prototype of the light combat helicopter will also do daily flying displays. Civil Aviation Minister Ajit Singh, IAF Chief Air Chief Marshal N.A.K. Browne, Karnataka Chief Minister Jagadish Shettar, Minister of State for Defence Jitendra Singh, Defence R&D Secretary V.K. Saraswat, Defence Secretary Shashi Kant Sharma, Defence Production Secretary R.K. Mathur and co-organiser FICCI’s chairperson Naina Lal Kidwai witnessed the show. Mr. Shettar released the State’s new aviation policy, which proposes incentives and a dedicated aerospace park for investing companies in the sector.